Every coffee or espresso lover wants that perfect cup, every time. Unfortunately, the water flowing through your machine contains minerals which begins to build up over time. While these minerals generally don't pose a risk to the health of the coffee or espresso drinker, they do pose a risk to the health of the machine. These minerals form limescale and other mineral deposits. These build-ups contribute to machine corrosion, poor overall performance and undesirable taste effects. Further, if not regularly removed, they can significantly reduce the lifespan of the coffee or espresso machine. Regularly using a high-quality descaling solution is the best way to eliminate such build-ups and keep your machine running like new. Custom-formulated by a chemist with decades of experience, our descaler is compatible with all espresso/coffee makers, including Keurig, Nespresso, Hamilton Beach, Braun, Bunn, Mr. Coffee, Delonghi, Tassimo, Krups, Cuisinart, Saeco, Senseo and more. Our formula is powerful and effective, yet gentle on your machine and is suitable for cleaning automatic machines, manual machines, pod/capsule/K cup machines, filter machines, commercial machines, cappucino machines, kettles and electric water heaters. In order to achieve optimal performance and machine lifespan, descale every 2-3 months. 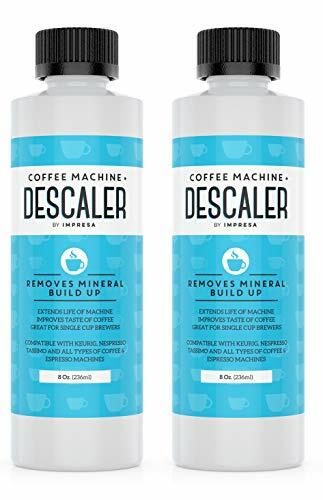 Each bottle of our descaler provides two applications (use half of the bottle each time) - 2 bottles per pack means 4 total cleaning applications with this product. PROUDLY MADE IN THE USA! PROUDLY MADE IN THE USA! Two bottles per pack, two uses per bottle (4 TOTAL USES). Descale every 2-3 months for best results.